GRAFENWOEHR, Germany — Serving overseas often provides a unique opportunity to see firsthand the hardships people face around the world such as poverty, lack of educational opportunities, limited access to medical care, and environmental exploitation. The Combined Federal Campaign-Overseas (CFC-O) gives you the opportunity to change lives, both locally and internationally, by giving to your favorite charities. 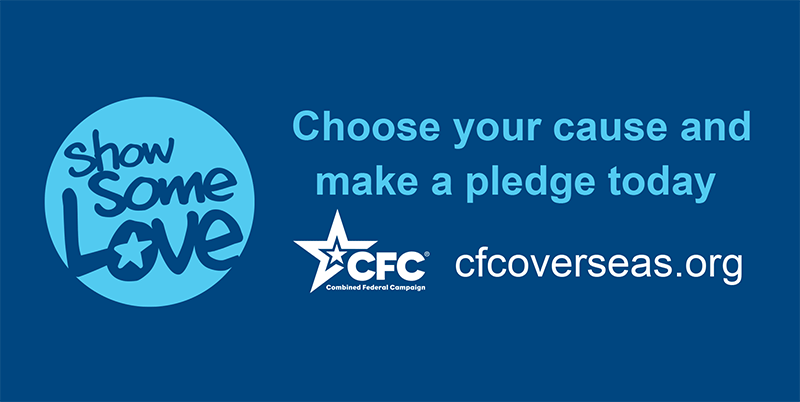 The CFC-O, is the annual workplace giving campaign for the five overseas unified combatant commands. In 2015, the campaign raised nearly $7 million to help those in need, demonstrating the selfless generosity of the overseas Department of Defense uniformed and civilian personnel. $10 provides two vaccines for a puppy or kitten. $20 provides a hot meal to a struggling military family. $58 teaches a child or adult to read. $75 sends eight exam tables to establish remote medical care clinics. $100 provides two tool kits that help families rebuild their lives. Pledging through the CFC-O carries on the proud military tradition of giving help and hope to those in need, so please consider making your pledge today. Dedicated uniformed and civilian personnel demonstrate their generosity each and every day with service to our country and by joining together to help people and communities in need through the Department of Defense Combined Federal Campaign-Overseas. For more information, visit www.cfcoverseas.org. or contact the USAG Bavaria CFC-O coordinator at DSN 475-8154, CIV 09641-83-8154.